Before I start extolling the virtues of tuna bake, may I just say I am loving this ugly food project? The very best recipes are timeless. Long ago, in the time before food blogs (gasp! ), these kinds of recipes were hand written on recipe cards and either shared or fiercely guarded. Things aren’t too different these days I guess, I’m still not sharing my prize-winning pickle recipes. 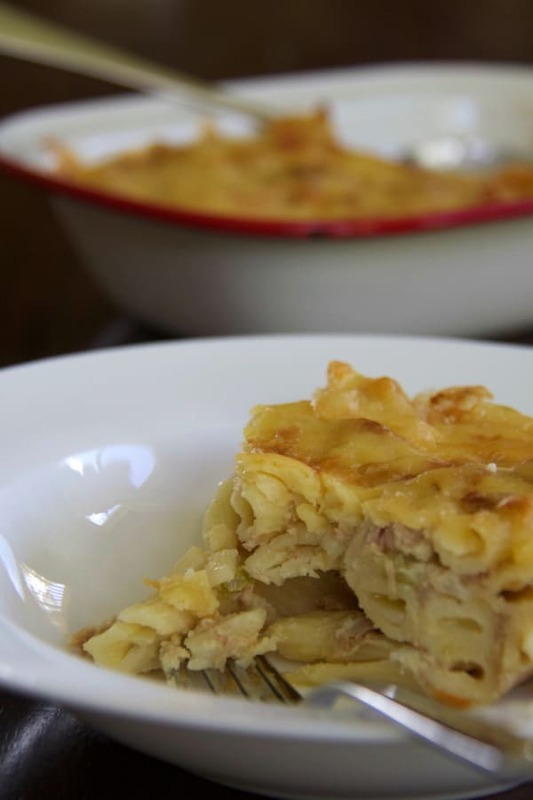 Tuna Bake has been around for eons and for good reason: it’s easy, it’s tasty and it’s budget friendly. The ingredients are things we routinely have in the pantry/fridge and it’s another fabulous late-home-from-footy freezer meal. Finely dice the onion, carrot and celery and sauté with the butter in a large saucepan until the onion is translucent. Add the flour and stir to coat the vegetables, cook over a low heat for several minutes. This is important, if you don’t cook it long enough, your tuna bake will taste of raw flour. Add the milk, 100mls at a time, stirring and allowing the mixture to thicken between additions. Add the cheese and mustard powder, stir until combined. Add the tuna, I think it’s best to break up the big bits but leave reasonable chunks – so you can recognise what you’re eating. Stir in the cooked pasta. 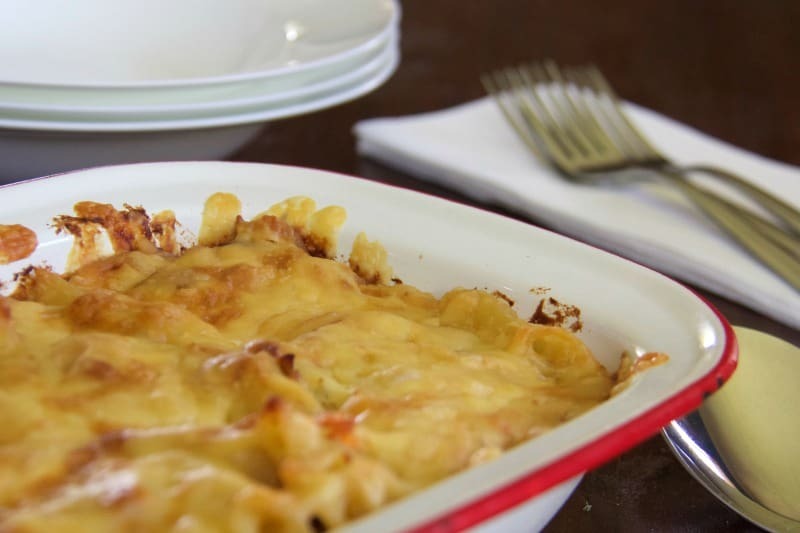 Transfer into an oven proof dish, top with extra cheese and bake in a 180ºC oven for 20-25 minutes or until golden. are there any secret recipes in your family? So no one except the cat and I eat Tuna so sadly I will never make this. Or maybe I’ll make it and tell them it’s chicken! Tuna is one of my favourite ingredients. This is pretty much my dream dinner, tuna, pasta and cheese! Ugly food for the win! 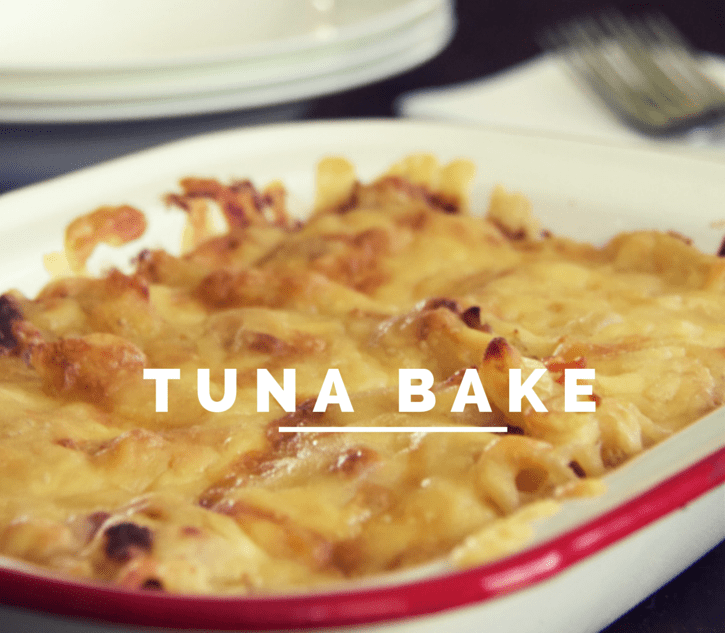 Tuna bake is our fail safe around here. I add spinach and parmesan cheese. Hmmmm. Salty. You’re so right – it’s a great keeper recipe. I think it looks quite good and I heard a belly rumble for sure. Our family prides itself on our Spag bol and I have successfully vegetarianised it!